There are many models for helping people to grow. One approach is based on how people live and work well together. 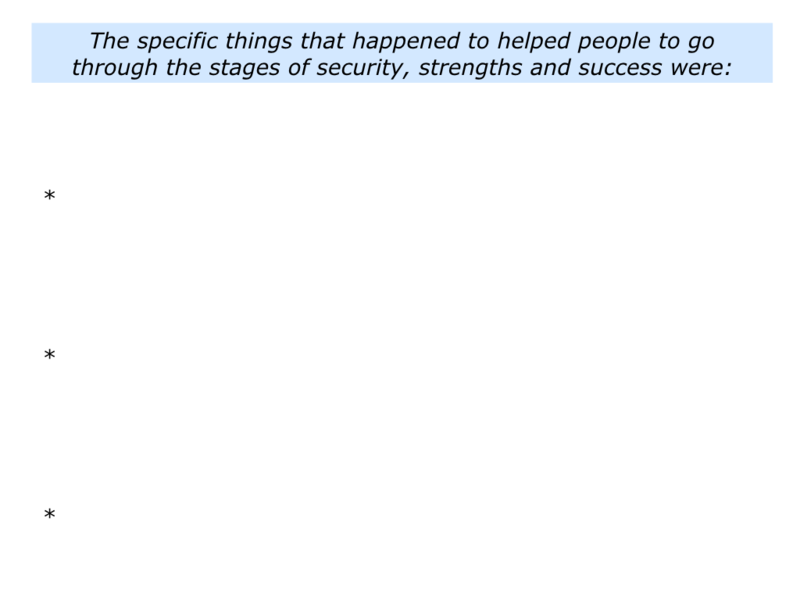 It is to focus on security, strengths and success. The model can be applied to building good relationships, schools, teams, organisations and societies. 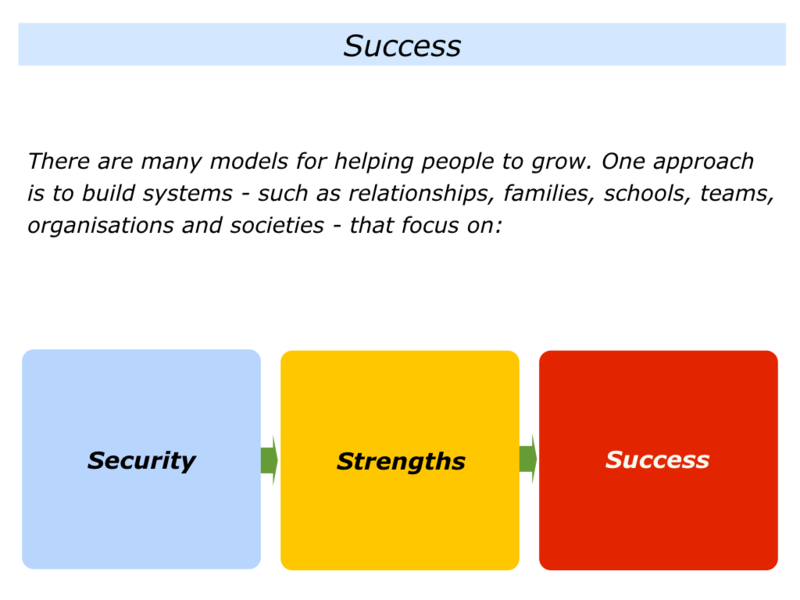 It can be used to build sustainable systems that achieve ongoing success. Different people apply this model in different ways. They do, however, focus on the following themes. They aim to create a safe environment in which people feel physically and psychologically secure. They recognise, however, that making this happen in the modern world may call for different solutions than those that have worked previously. They encourage people to build on their strengths. They also pursue strategies that give people the greatest chance of success. 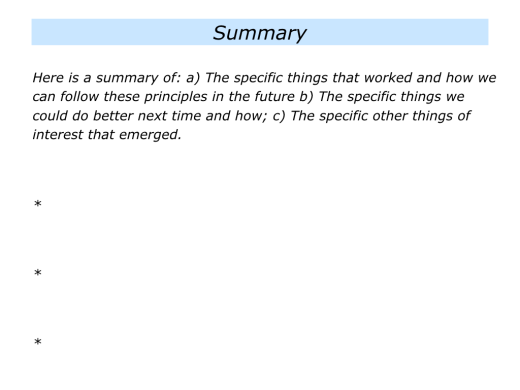 They translate these strategies into clear plans in which people know their parts in working to achieve the goals. They encourage and enable people to achieve success. They continually share success stories that show the principles that people can follow to succeed. They believe in constant improvement and aim to achieve sustainable success. Looking at your own life, can you think of a situation in which people have been helped to go through these stages? This may have been one you experienced or one that you have heard about. You may have gone through these stages in a relationship, school or at work. Alternatively, you may have heard about how people took these steps in a team, organisation or when tackling a challenge in society. What happened to enable people – you, the person or the group of people – to go through these stages? 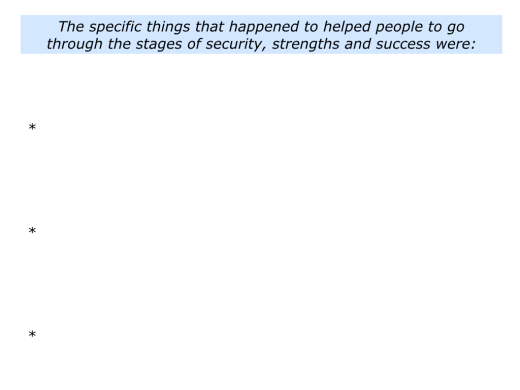 How were they given a sense of safety and security? How were they helped to build on their strengths? 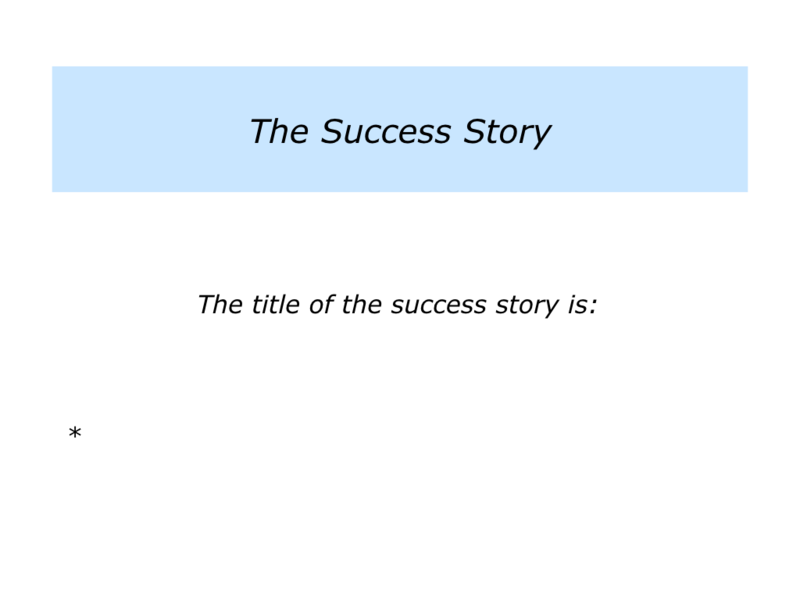 How were they helped to achieve success? 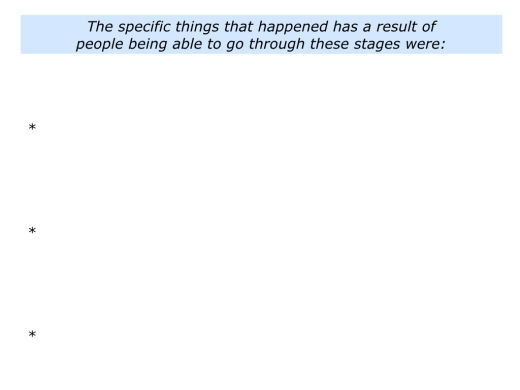 Describe the specific situation you have experienced or have heard about in which people were able to go through these stages. 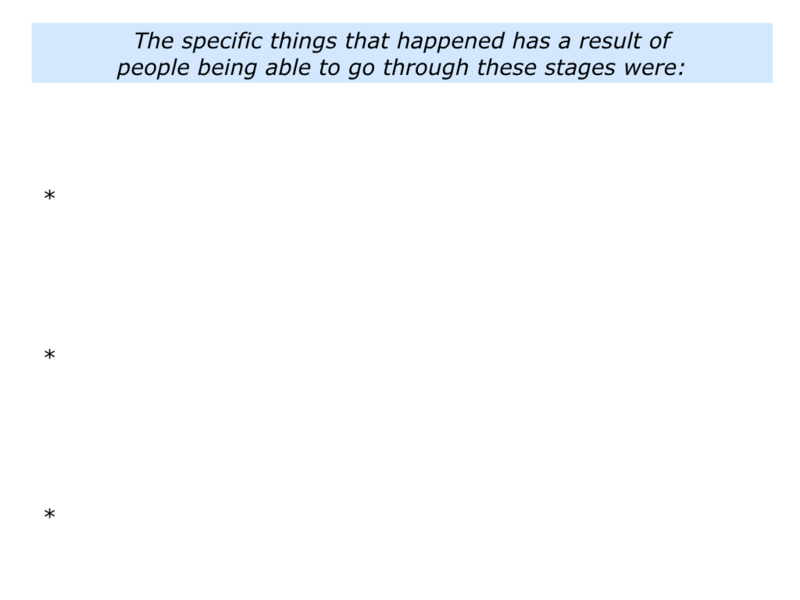 Describe the specific things that happened to help people to go through these stages. 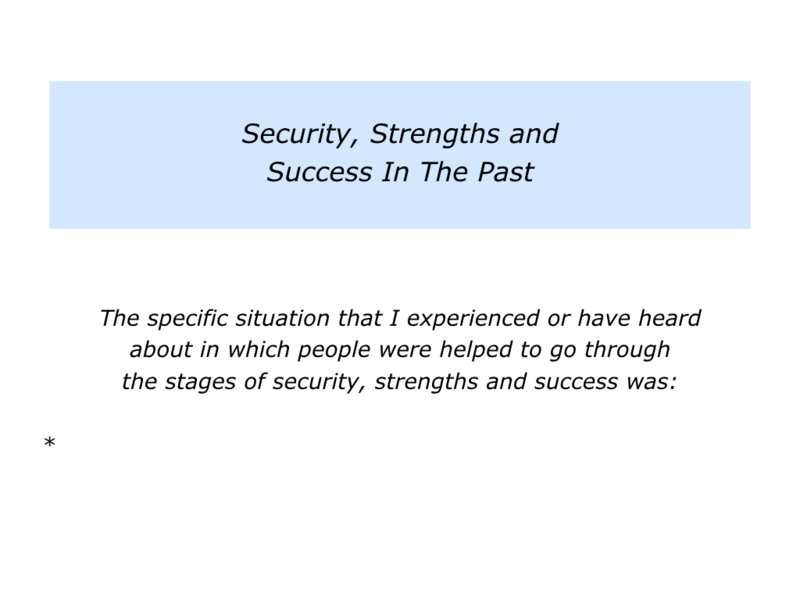 Describe the specific things that happened as a result of focusing on security, strengths and success. Many people follow these steps in their personal and professional lives. They may do this when aiming to build an encouraging family, school or organisation. Caring parents, for example, are positive and predictable rather than negative and unpredictable. They create a safe and loving atmosphere in which children can grow. Caring teachers create a stimulating climate in which students can explore and learn. They help them to build on their strengths and develop skills they can use to shape their future lives. Caring leaders create a positive environment in which motivated people can achieve peak performance. They then encourage people to pursue the organisation’s strategies and make their best contributions towards achieving its picture of success. 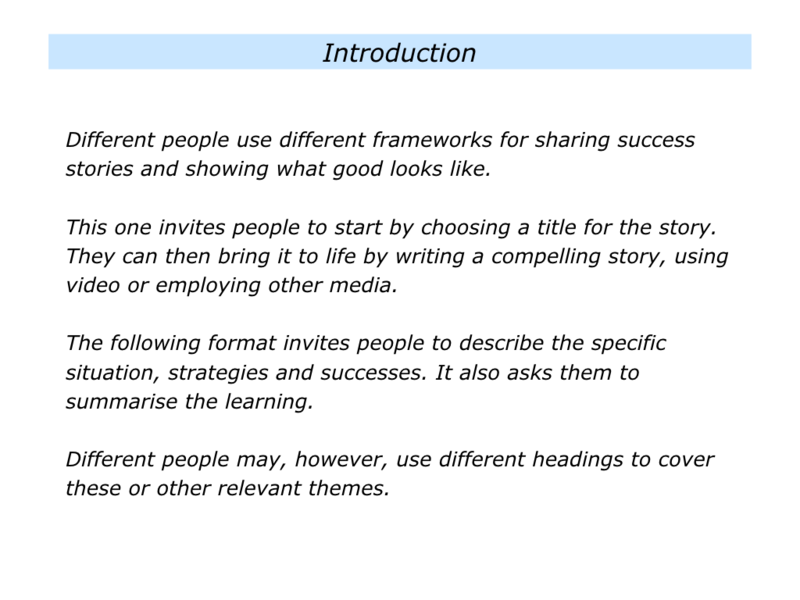 Imagine that you want to focus on these themes when encouraging a person or building a team or organisation. Let’s explore how you can help people to achieve success. People want to feel safe. So it is vital to create an environment in which people feel physically and psychologically secure. Sometimes this calls for going beyond recognising their basic needs for safety and encouragement. Caring leaders, for example, try to create a positive and predictable environment in which people can grow. People like to feel in control. They are more likely to do so in a stable environment in which things are relatively predictable. Such leaders communicate a clear plan that people can believe in. They give people the opportunity to choose whether they want to pursue the plan and make their best contribution. They then get some quick successes. This helps to build confidence in the plan and provides the platform for shaping a positive future. People want to feel safe and secure, but events can happen that can shake this confidence. This is especially so in a fast moving world. During the past 20 years many leaders have attended seminars to explore how their organisations and people can thrive in what has been called a VUCA world. This is a world where situations can be volatile, uncertain, complex or ambiguous. Below a video that describes the importance of following your values in such a world. Caring leaders help people to feel physically safe. They protect them by providing physical safeguards that do not violate their society’s values. This can be a hard balancing act, but is vital to ensure people can feel safe. Such leaders recognise the need to create fair societies in which people feel they have the opportunity to live flourishing lives. People need to feel valued rather disenfranchised. Failure to do this can lead to resentment and social unrest. How to help people to feel psychologically secure in such a fast changing world? This can be challenge, but there is hope. Let’s consider some potential ways forward. Caring societies, for example, pursue core values that enable people to grow. These values often embody qualities that many would describe as common decency. These include characteristics such as kindness, honesty and wisdom. Such values provide a common compass and a stabilising force in a VUCA world. How to help people to feel in charge of shaping their futures in such a world? This calls for educating and enabling people to develop skills for dealing with complexity. There are many approaches to making this happen. One approach focuses on enabling young people to learn what are called 21st century skills. These are the Four Cs of Critical Thinking, Creativity, Collaboration and Communication. They are then more able to be self managing and shape their futures. You can learn more about these skills via the following link. Great educators, for example, aim to pass on positive models and practical tools that people can use to expand their way power. People then have more choices and ability to shape their futures. You can read more about this approach via the following link. Let’s return to your own life and work. 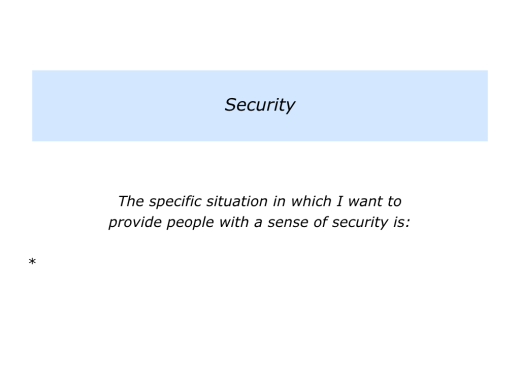 Looking ahead, can you think of a situation in which you would like to help a person or a group of people to have a sense of security? 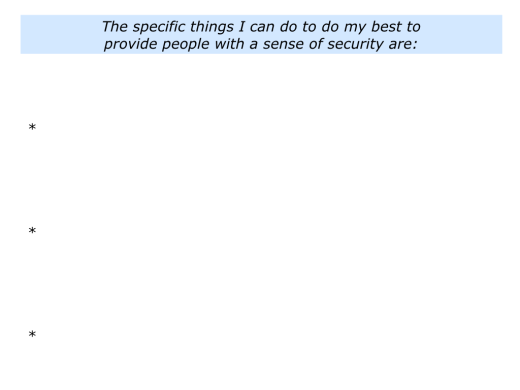 You cannot guarantee complete security, of course, because some events will be beyond your control. There are many things you can do, however, to help them feel confident and able to deal with challenges. You may want to take this step when encouraging people in your family, educating students, leading a team, building an organisation or making a contribution to society. How can you create a safe and encouraging environment? How can you help them to build on what they can control and shape their futures? What else can you to do help them to feel more physically and psychologically secure? 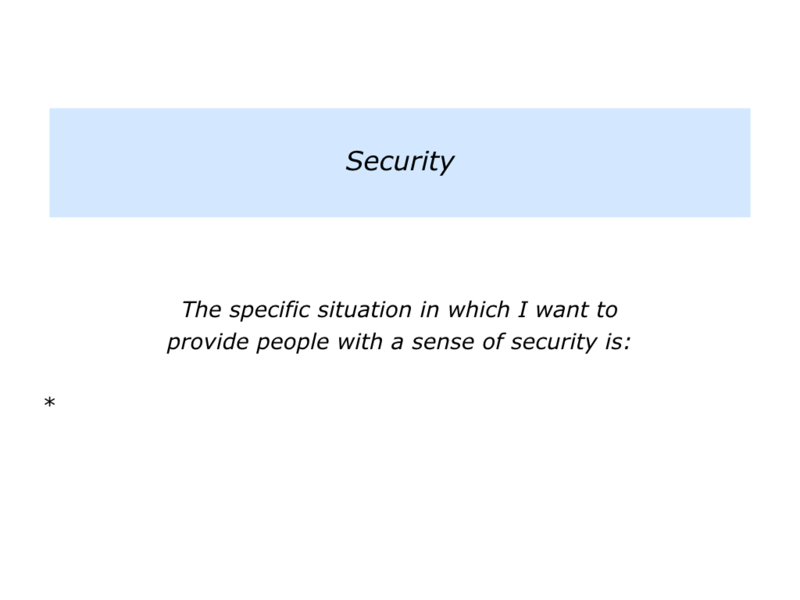 Describe a specific situation in which you want to provide a person or group of people with a sense of security. 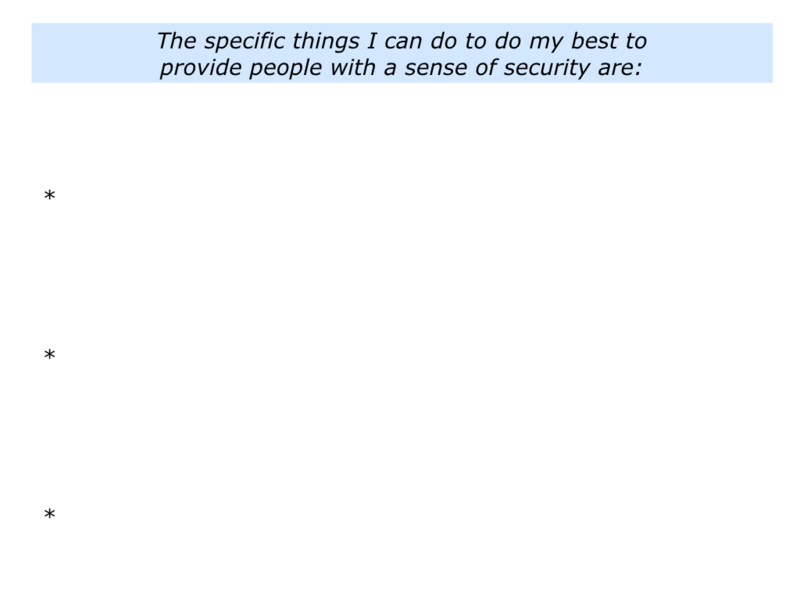 Describe the specific things you can do to do your best to provide people with a sense of security. Caring parents create a loving environment and encourage people to build on their strengths. One person explained this in the following way. “My parents always encouraged me. Even when I was in a wheelchair for a year, they focused on what I could do, rather than what I couldn’t do. “When I began walking again, it was hard for me to do sports. So my parents spent time and money on us learning to sail together. Good educators help students to build on their strengths and manage the consequences of their weaknesses. They also help them to learn practical skills that they can use to shape their futures. The Design For Change programme adopts this approach in its work with young people across the world. Below is a video that describes the fruits of this approach. You can discover more via the following link. Great organisations build on their strengths. 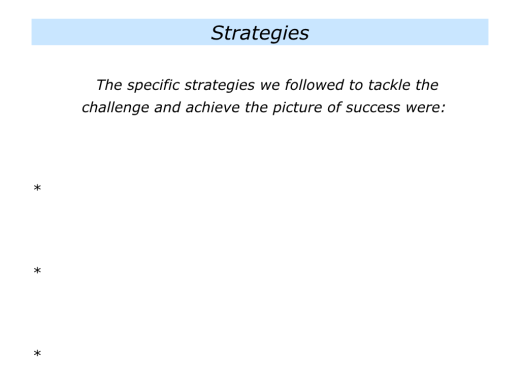 Bearing these in mind, they clarify the key strategies they can follow to achieve their picture of success. They communicate these strategies to their people so that everybody knows the plan. People can then decide if they want to opt in and make their best contributions towards achieving the goals. To make clear contracts about their best contributions and get the support they need to achieve the goals. To perform superb work and continue to develop on the way towards achieving the picture of success. Great societies also mobilise people’s strengths when faced by crises. They take this route when dealing with a medical issue, clearing up after an earthquake or tackling other challenges. They ask some of the following questions. What is the challenge? 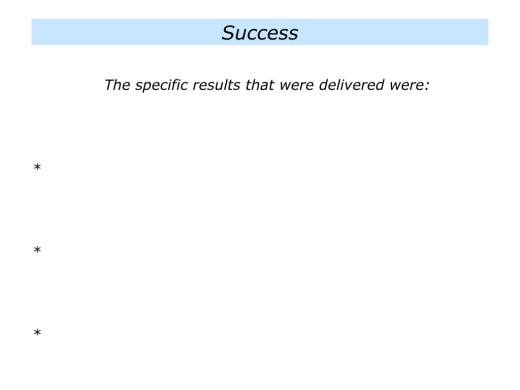 What are the real results we want to achieve? What is the picture of success? What are the strengths we have available? 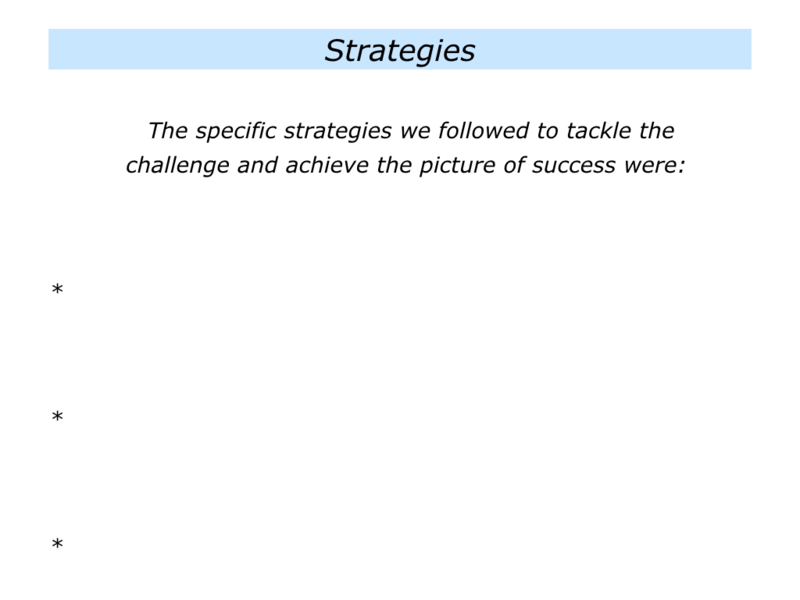 How can we co-ordinate these strengths to achieve the goal? How we help people to do superb work and give them the support they need to do the job? What else can we do to achieve the picture of success? Let’s return to the scenario where you want to help people have a sense of security. Looking at this situation, how can you help people to build on their strengths? How can you give them support on the journey? 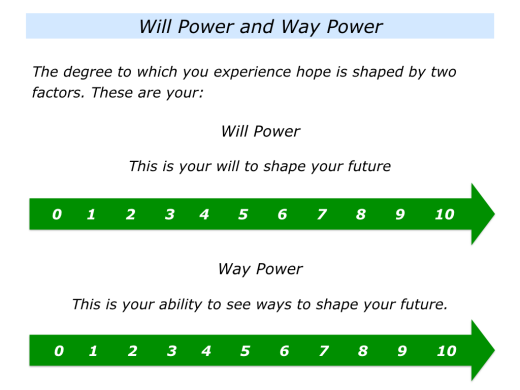 How can you, if appropriate, help people to co-ordinate their strengths to achieve their goals? 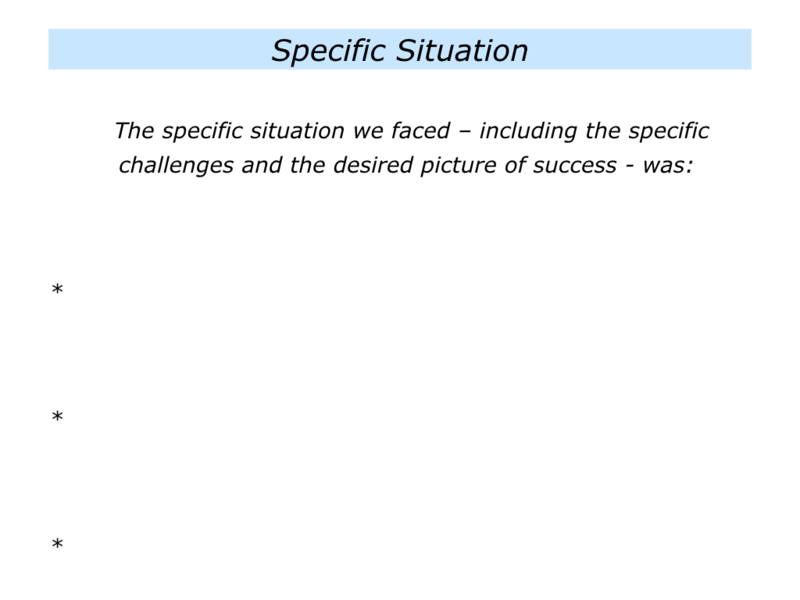 Describe the specific situation in which you want to help people to build on their strengths. Describe the specific things you can do to help people to build on their strengths. Different people choose different ways to help others to succeed. The steps they take often depend on whether they are helping a person, team or organisation. Below are links to articles that highlight how people can do satisfying work and, if appropriate, build super teams. These are written from the point of view of a person wanting to take these steps. If you wish, you can adapt these ideas to help people to achieve success. Great organisations also enable people to perform superb work and achieve their goals. They then, when appropriate, encourage them to focus on constant improvement. They create sustainable systems that enable people to achieve ongoing success. Such organisations get the right balance between the global and local. They combine the best aspects of a big organisation with the spirit of a small enterprise. How do they make this happen? 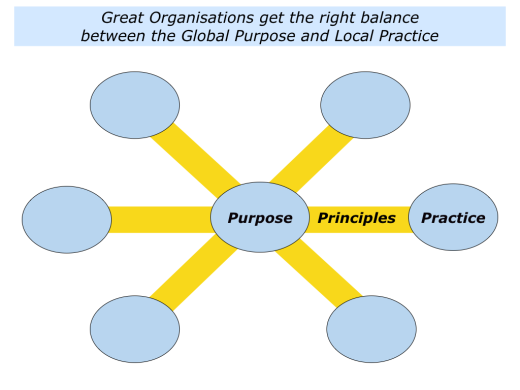 The centre communicates the purpose and the principles. The way that people practice these is up to them, within parameters, in their part of the organisation. But this comes with a proviso. People must show how what they are doing is following the principles and contributing to the purpose. Let’s explore how to make this happen. Imagine you lead a large organisation. You can communicate the big picture, whilst also encouraging people to take ownership for the local practice. Great leaders encourage people to think global and act local. This calls for creating an adult-adult relationship, however, with everybody taking responsibility for making their best contributions to the organisation. Imagine that you are addressing everybody in the organisation. You might say something along the following lines to explain the approach to people. But there is key point. You must show how what you deliver supports the principles and contributes toward achieving the purpose. Great leaders get the right balance between the centre and the satellites. They also manage by outcomes, rather than by tasks. They translate the purpose into specific goals. Each satellite then makes clear contracts about their contribution towards achieving the organisation’s goals. People are given great autonomy. But, as mentioned earlier, they must keep showing how what they are delivering is contributing towards achieving the overall picture of success. 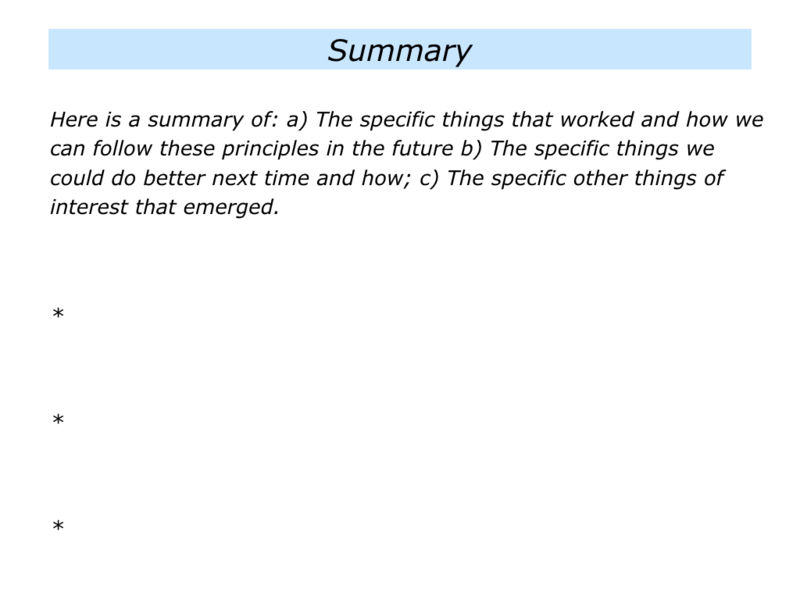 The specific things we have delivered in the last quarter towards achieving the purpose. The specific things we plan to deliver in the next quarter. The specific challenges we face, our plans for tackling these and the support we would like to do the job. Imagine you lead an organisation. A key element will be to build and maintain a positive culture in which people know ‘what good looks like’. 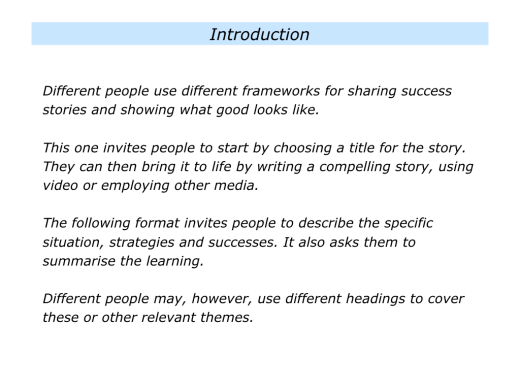 Imagine you want to produce stories that provide positive models for people in your organisation. 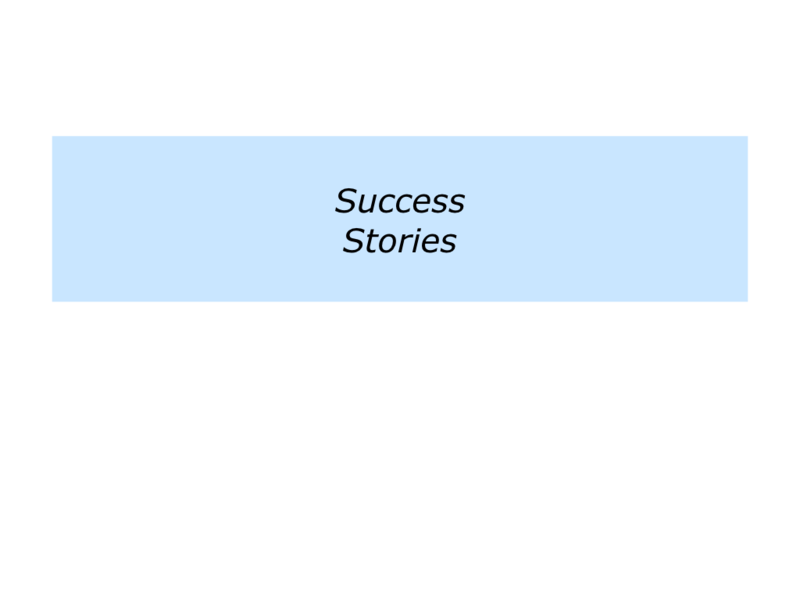 There are many frameworks for producing such success stories. Here is one approach. There are many ways to help people to grow. 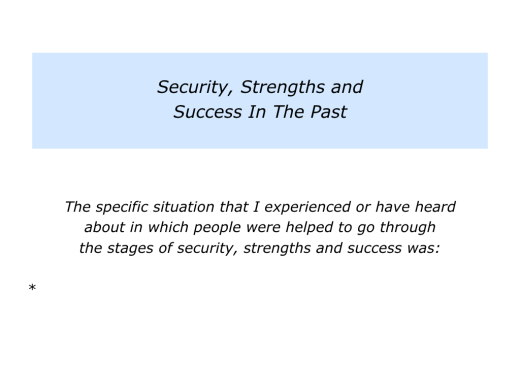 One approach is to keep focusing on security, strengths and success. Describe the specific situation in which you would like to follow these steps and help a person or a group of people to achieve success. Describe the specific things you can do to do your best to help them to achieve success.